Handmade needles and needles are slowly crocheted, finely arranged to design needle patterns, pure cotton thread with leather rubber sheet bottom, pure beauty, pure and tough, can accompany the long and long time package. [product design features] ◎ Select high-quality natural original embryo cotton thread, hand-woven crocheted in one piece, one eye and one needle carefully and firmly. 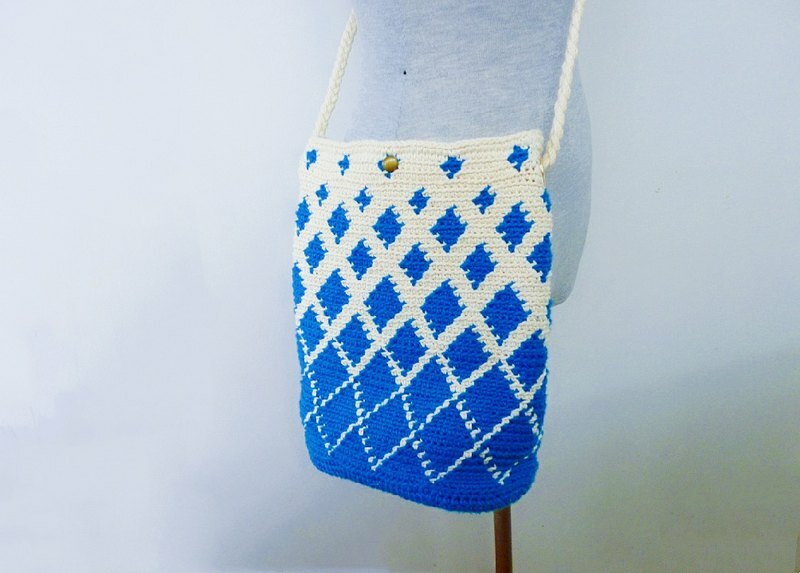 ◎ The texture is meticulous and flexible, conveying the original beauty, which is a bag that designers love very much. ◎ Carefully arrange the weave, even the back rope is also hand-woven. ◎ Inside the cotton cloth, there is a flat pocket, which can be placed in small items, which is not afraid of being caught. ◎ There is a strong magnetic buckle at the mouth of the bag. ◎ With the bottom of the leather rubber plate, the bag shape is more beautiful, and it also has the functions of anti-dip and bottom deformation. (Flower Rabbit Handmade begins with a flower rabbit that commemorates the designer, cares for the animal and the beginning of the nursing, does not use leather!) ※※**flower rabbit hand made woven bag each one is unique in the world**,**does not love doing repetitive**,**back out never hit the bag**~ ※※ The color, size, weaving pattern and matching handle of each bag are carefully designed and produced. I hope that each unique bag can show the owner's unique temperament :) ※**There are any questions or special care details**,**Please ask beforehand**,**then make an order action**! [Material and Washing] Selected high quality original embryo cotton thread, leather rubber board, small hardware ◎ Daily use of slightly dirty can be wiped with a wet wipe, forgive. ◎ If you feel that it has been tasted or wet for a long time, use a wet wipe or a small amount of water to rinse it with a towel or a white newspaper. 【size】 Flat measurement: ● The center of the body is not stretched by about 30cm ● The bottom of the leather does not stretch about 20*10cm ● The diagonal back rope is about 102cm long. (error is about 1~2cm) [Flower rabbit hand made the original intention and small 叮咛] ◎ Hand works and the transmission of love is the original intention of the flower hand rabbit to start selling hand works. ◎The sales income is used in the rabbits to feed and rescue the waves. ◎I wish to make the world a better place with the power of small bean sprouts~ ◎Hand sewing with one stitch and one thread may have some imperfections. ◎Everyone has different screen settings, so the actual product and the screen display may have a slight color difference. ◎Handmade, perfectionist for color and work, please think twice before buying. ◎On Saturdays and Sundays, the family day and materials procurement will be processed for one day, and will not be shipped (except for special orders). ◎ Part-time non-exempt orders, if there is a specified time limit arrival date, please confirm the order before the order, do not place the order directly, can not be allocated a reasonable meeting. ◎ Non-24 hours online, please contact us if you have any questions, wait patiently, and you will reply and deal with it in the first time!